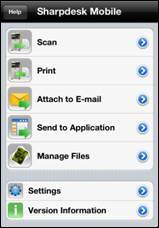 “Sharpdesk Mobile” is a powerful, cutting edge mobile scanning and printing application that connects supported Sharp MFDs via a wireless LAN with the suite of popular mobile devices such as iPhone, iPad, AndroidTM, (Windows® 8, 8.1, 10, or Windows® RT 8.1)* devices. *Version 2.2 for Windows® is for Windows® 8.1, RT 8.1 and 10 only. Connect to a Wi-Fi network, select a document, preview and print directly to a supported Sharp MFD from your mobile devices. Scan hard-copy documents to PDF, JPEG or TIFF file for easy access by simply scanning from a Sharp MFD to your mobile devices. Your mobile device’s profile can be stored as a “scan-to” location on the MFD for easy access. 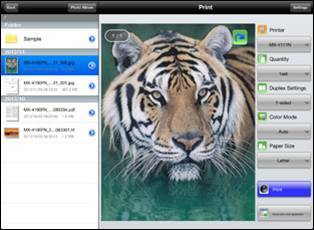 Sharpdesk Mobile allows seamless file sharing with other applications. Users can attach scanned files to email, share documents with other applications mobile devices or print files from other applications. 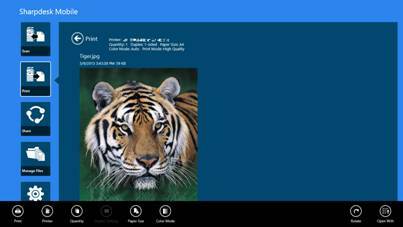 * E-mails and web pages must be previewed and shared from standard Windows Store app (Mail app and Internet Explorer respectively) on Windows version (V2.0 or newer). ** Supported on limited Sharp MFD. For details, see Supported Sharp MFDs below. * Newly supported from V2.0. Requires firmware upgrade. * These models always print only 1 copy (Print Quantity is not supported). *1 MX-PB14/Printer Expansion Kit is required to print. *2 MX-PB11/Printer Expansion Kit is required to print. *3 MX-PB13/Printer Expansion Kit is required to print. *4 MX-PB15/Printer Expansion Kit is required to print. *5 MX-PKX1/PostScript® 3 Expansion Kit is required to print PDF files. *6 MX-PKX5/PostScript® 3 Expansion Kit is required to print PDF files. *7 MX-PK11/PostScript® 3 Expansion Kit is required to print PDF files. *8 MX-NSX1/Network Scanner Expansion Kit is required to scan. *9 MX-HD10/Hard Disk Expansion Kit is required to install MX-PB14 and MX-PK11 into MX-2010U. *10 MX-HD12/Hard Disk Expansion Kit is required to print encrypted PDF files. *11 MX-EB16/Productivity Kit is required to print encrypted PDF files. *13 MX-PK10/PS expansion Kit required to print. *14 MX-PK13/PostScript® 3 Expansion Kit is required to print PDF files. *15 MX-PU10/Direct Print Expansion Kit is required to print DOCX, XLSX and PPTX files. *16 Supports scanning to and printing DOCX, XLSX and PPTX files. *17 MX-HD14 or MX-HD15/Hard Disk Expansion Kit is required to print encrypted PDF files. * Newly supported on V2.0 or later. ** Newly supported on V.2.2 or later. Scan to and print these formats supported on limited models. Devices running iOS 8 through 10. Android based mobile devices running Android 4.1 through 6.0 (Recommended screen resolution: 800x480 pixels and higher). Mobile devices running the following OSes. For further information and inquiries about this application, contact us http://www.sharp.net.au/contact/contact-us. App Store is a service mark of Apple Inc. Apple, iPhone, iPad and Bonjour are trademarks of Apple Inc., registered in the U.S. and other countries. IOS is a trademark or registered trademark of Cisco in the U.S. and other countries and is used under license by Apple Inc. Android, Android logo, Google, Google logo, Google Play and Google Play logo are trademarks or registered trademarks of Google Inc. Microsoft, Windows and DirectX are registered trademarks of Microsoft Corporation in the United States and other countries. Sharpdesk is a trademark or registered trademark of Sharp Corporation in the U.S. and other countries.